The Red Poppy Art House invites you to join “A Challenge of Being,” a collective exploration on empathy, presence, authenticity, and vulnerability. How vulnerable is it to be real? What prevents us from being authentic? What is the challenge to be present for another? How can we empathize with the uncomfortable? 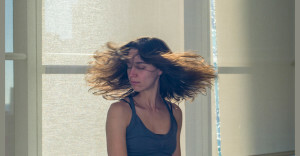 Originally from Greece, Maria Lentzou is an expressive arts therapist, interdisciplinary performing artist, and the founder of Authentic Movement SF. Her performance work has been presented locally at Z Space, PianoFight, Red Poppy Art House, and CounterPulse, as well as internationally in England, Peru, and Argentina. mariA enjoys creating simple performative acts as an invitation to the imaginary through embodied experiences that provide an all-time-in-between space, where playfulness meets sacredness and vice versa. Her mission is to honor the beauty of our multifaceted existences, along with the mystery of life-death-life in its paradoxical nature; to embody and communicate the power of authenticity, of humbleness, and of love.